Implementation Plan assigns lead agen- cies and supporting agencies for each of 36 identifi ed taskings. For each tasking, there are defi ned objectives, next steps (with specifi c timelines), and method- ologies for measuring progress toward completion of the task. United Nations Convention on the Law of the Sea (UNCLOS). USCGC Healy, is considered a medium icebreaker. While it has less icebreak- ing capability than Polar Star, Healy has extensive scientifi c research assets, also important for completion of the Imple- mentation Plan. Canadian and American interventions in the Arctic have been economically driv- en and have centered heavily on extrac- tive industries. As a consequence, both nations have very limited infrastructure in the Arctic and limited polar icebreak- ing assets. While oil and gas extraction will continue to be challenging and ex- pensive (particularly given that oil and gas prices are not expected to rise in the foreseeable future), extraction of rare earths and other strategic minerals from the Arctic region has signifi cant and cur- rent economic potential. Arctic Archipelago and are being opened in Greenland and Siberia. 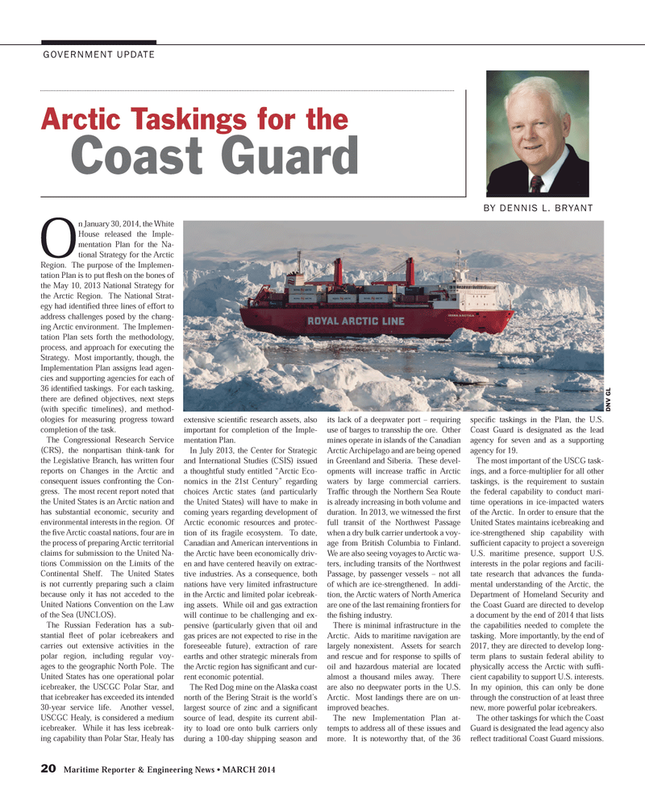 These devel- opments will increase traffi c in Arctic waters by large commercial carriers. Traffi c through the Northern Sea Route is already increasing in both volume and duration. In 2013, we witnessed the fi rst full transit of the Northwest Passage when a dry bulk carrier undertook a voy- age from British Columbia to Finland. Passage, by passenger vessels – not all of which are ice-strengthened. In addi- tion, the Arctic waters of North America are one of the last remaining frontiers for the fi shing industry. Arctic. Aids to maritime navigation are largely nonexistent. Assets for search and rescue and for response to spills of oil and hazardous material are located almost a thousand miles away. There are also no deepwater ports in the U.S.
Arctic. Most landings there are on un- improved beaches. The new Implementation Plan at- tempts to address all of these issues and more. It is noteworthy that, of the 36 specifi c taskings in the Plan, the U.S.
Coast Guard is designated as the lead agency for seven and as a supporting agency for 19. Department of Homeland Security and the Coast Guard are directed to develop a document by the end of 2014 that lists the capabilities needed to complete the tasking. More importantly, by the end of 2017, they are directed to develop long- term plans to sustain federal ability to physically access the Arctic with suffi - cient capability to support U.S. interests. In my opinion, this can only be done through the construction of at least three new, more powerful polar icebreakers. Guard is designated the lead agency also refl ect traditional Coast Guard missions.